Water is a resource that all of us tend to take for granted. We turn on the shower, the kitchen faucet, or the garden hose and out pours an endless supply of fresh, clean water. What many of us may not realize is that our water supply is not as clean as it may appear. Chlorine is often used but if the water is contaminated, it is unable to effectively treat some of the harmful bacteria found in the water. Exposure to certain harmful bacteria can cause severe illness and even death. Treating your water supply using UV disinfection is not only more effective than traditional treatments, but it is also an environmentally responsibly way of treating our water. There are no disinfection by-products with the use of UV which is safe and chemical free. Plus, UV does not alter water chemistry and its constituents, such as pH, taste, odour, or colour. Purchasing a UV disinfection system for your home has a low operational cost. The energy used by a UV disinfection system in an average size home is comparable to the same energy used by a 40-watt bulb! If you are unsure of the microbiological quality of your source water or if you are looking for additional security from your municipal water source, then Luminor has the solution in the Blackcomb 5.0 series of residential UV systems. UV technology is proven to control microbiological (which is bacteria and virus) issues in water including E. Coli, Cryptosporidium and Giardia Lamblia. Truly modular in design, Blackcomb 5.0 allows easy upgradeability in the future.Want to wait to install a UV monitor? No problem, Blackcomb 5.0 POE systems give flexibility. With a multitude of screens displaying diagnostics, status, warnings and even QR codes for a link back to Luminor’s website, the Blackcomb 5.0 systems introduce technology never seen in a UV system! Healthy, clean and safe. Advanced water disinfection systems for the home. Install a TrojanUVMax™ disinfection system and you no longer have to be concerned about waterborne pathogenic organisms causing illnesses or contaminating production processes. 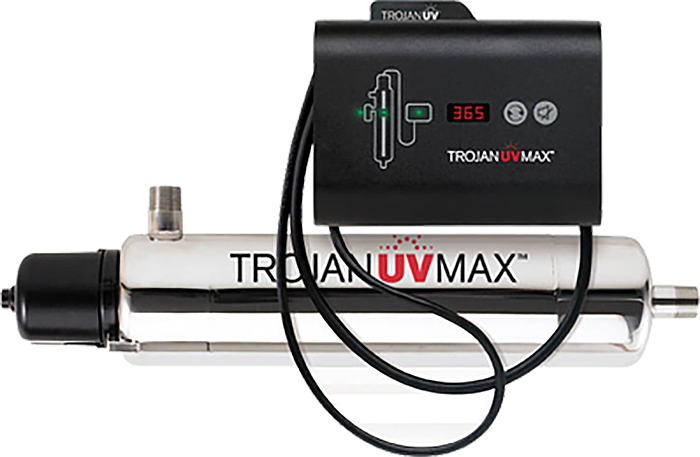 Trojan UV systems kill bacteria, viruses, and other pathogens by preventing them from reproducing. The result? Safe drinking water. certified by NSF International, the leading authority on residential water treatment system testing, against the rigorous requirements of NSF Standard 55 Class A.From procurement and manufacturing to shipping and performance, NSF Standard 55 Class A certification ensures water treated by a TrojanUVMax™ Pro Series product is safe.With both 8.2 and 17.8 gallon-per-minute models and a full 5-year warranty against manufacturer defects on the water chamber, power supply and all electrical components, the Pro Series is sure to meet all your disinfection requirements. UV Pure’s patented Crossfire Technology™ is globally recognized as the most advanced and effective UV purification system. Their certified Hallett™ systems provide pure, safe drinking water in thousands of regulated environments such as municipalities and hospitals. The Upstream™ series of UV systems provides pure water at the same high standards, but at an affordable price for installations not requiring certification. All Upstream systems are laboratory validated, and include a remote monitor so you can be sure your water is safe.